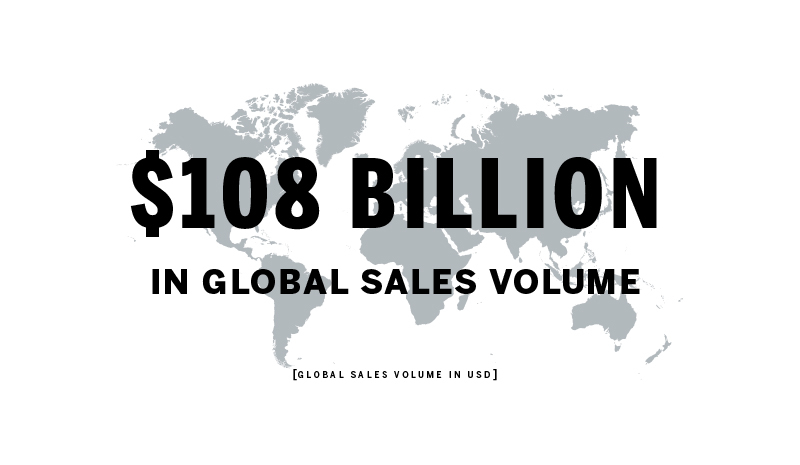 Sotheby’s International Realty Affiliates LLC reported on March 1, 2018 that in 2017 its affiliated brokers and sales professionals achieved approximately $108 billion USD in global sales volume – the highest annual sales volume performance in the history of the brand. The Sotheby’s International Realty brand also reported growth across its global network. At year-end, the network totaled nearly 950 offices and approximately 22,000 sales associates worldwide. In the United States, the Sotheby’s International Realty brand achieved over $96 billion USD in sales volume in 2017 and added six independently owned and operated residential real estate firms to its network and 58 new offices. This past year witnessed continued significant growth by the brand’s existing affiliate companies through talent attraction as well as mergers and acquisitions, most notably increasing the brand’s market presence in the San Francisco Bay Area; Castle Rock, Colorado; and in Southern Florida and Key West. The brand also entered several key new markets last year, namely: Roseville, California; Avalon and Stone Harbor, New Jersey; the Central and Western Adirondacks regions of New York; Greater Greenville, South Carolina; and southeast Wisconsin. Outside the United States, the Sotheby’s International Realty brand achieved over $12 billion USD in sales volume in 2017 while continuing to expand into key markets. In Europe, the brand grew its presence in Spain into the coastal cities of Valencia and San Sebastián, and in Belgium to Antwerp and Waterloo, as well as expanding to the Greek island of Rhodes. The brand also sold the rights to the Asian countries of Vietnam, Indonesia and Sri Lanka to establish a future presence, and grew within India to include the key markets of Mumbai, Bengaluru, Chennai, Pune, Goa and Kolkata. 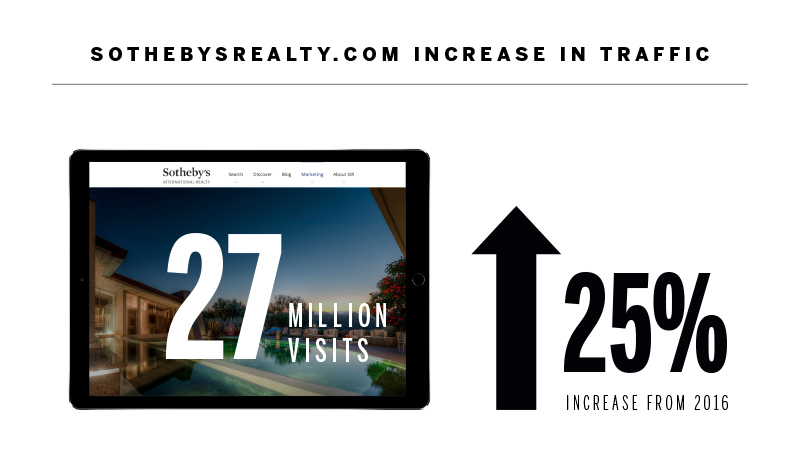 The Sotheby’s International Realty brand website, sothebysrealty.com, saw another record year with nearly 27 million visits, a 25% increase year-over-year, with 60% of visitors coming from outside the United States and 17.5% of traffic being from new users. An exclusive alliance with the Nikkei, the most influential news publication in Japan, was launched in 2017. The alliance enables the brand to generate Japanese buyer interest through the Nikkei’s digital platform which reaches over 29 million monthly readers. The Sotheby’s International Realty brand is the first real estate brand to present property listings outside of Japan to readers of the Nikkei, giving Japanese consumers access to residential real estate offerings in nearly 70 countries and territories. In 2017, the Sotheby’s International Realty brand added to its senior leadership team. Thompson was appointed as the brand’s Chief Marketing Officer to oversee the marketing, advertising, and public relations initiatives worldwide. With an extensive background working with globally recognized luxury brands, Thompson set forth early in the year to create exceptional consumer experiences through the strategic use of marketing and branding. Later in the year, Julie Leonhardt-LaTorre, a proven global real estate and management leader, was appointed Chief Operating Officer to spearhead strategic growth plans for the brand. The Sotheby’s International Realty brand’s affiliated companies and sales associates raised more than $500,000 USD for New Story, the brand’s charitable partner and a certified 501(c)(3) non-profit organization, by the end of 2017. The funds raised will go directly to the construction of new homes in Mexico. The highlight of the partnership came at the brand’s Global Networking Event, where affiliates of the Sotheby’s International Realty brand pledged funds for over 150 homes in just 32 hours. The Sotheby’s International Realty brand was the No. 1 real estate brand represented in two of the six categories that comprise the 2017 REAL Trends/The Wall Street Journal “The Thousand” for the second year in a row. The brand claimed 46 of the top 250 sales associates in the REAL Trends Individual Sales Volume category, more than any other real estate brand, and had the highest combined individual sales volume from sales associates in the same category. In addition, the Sotheby’s International Realty brand had the most individuals represented in the Individual Average Sales Price category. Sotheby’s International Realty listings are marketed on the sothebysrealty.com global website. In addition to the referral opportunities and widened exposure generated from this source, each brokerage firm and its clients benefit from an association with the Sotheby’s auction house and worldwide Sotheby’s International Realty marketing programs.